Fruits and vegetables will never be as nutritious as they are the moment you pluck them off of the vine, or tree, or out of the ground. Every hour that goes by after that, their nutritional value literally withers away. 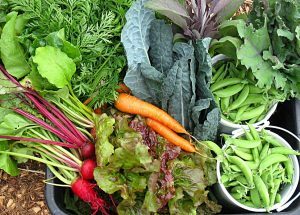 Vegetables lose between 15 and 77 percent of their vitamin C within a week of harvest, according to a 2007 University of California Davis paper published in the Journal of the Science of Food and Agriculture. And that’s if they’re kept refrigerated the whole time! Spinach can lose 90 percent of its vitamin C content within 24 hours of harvest, according to a 2005 Penn State University study. 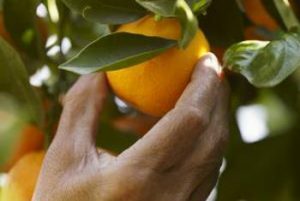 “Vitamin C degrades rapidly after harvest, and this degradation continues during storage,” writes Dr. Diane Barrett, a food chemist at UC Davis. Vitamin C losses in vegetables kept refrigerated for 7 days after harvest range from 15% for green peas to 77% for green beans, she says. Though less literature is available on them, Barrett deduces that the light and heat-sensitive B vitamins are lost at similar rates. The warmer the temperature, the faster the vitamin degradation, the Penn State study found. Spinach kept at 39 degrees (normal refrigeration temperature) lost about half of its folate in eight days. “At higher temperatures, the spinach lost its nutrients at an accelerated rate,” the Penn State press release says. At 50 degrees, it took only six days for the spinach to lose half of its folate, and at 68 degrees it took only four days. Carotenoids were lost at the same rate. “Spinach is prized because of its high nutrient content, particularly folate and carotenoids,” says Penn State food science professor Luke LaBorde. 5 days in transit before arriving at a distribution center, and another 3 days on a grocery store shelf, before they are purchased by the consumer, who may store them for up to 7 days prior to consumption, Barrett notes. Fruits and vegetables grown in the southern hemisphere for winter and spring consumption in the U.S. can sit in refrigerated ships for several weeks. “There is such a high demand for fresh products that it places a heavy burden on the producers,” said LaBorde. Maybe it’s time to start growing community gardens that can do that, or at least buying from local farmer’s markets!